For years history has celebrated the crews of elite astronauts who rode fire to the Moon and the unique twelve who walked on its surface. To a lesser degree, the senior mission specialists working in Houston and in Florida were also lauded. But at its height during the Apollo program 400,000 people were involved in the Moon effort at NASA, its various contractors and sub-contractors. The story of these thousands is seldom heard, but their tales are just as heroic in terms of the dedication and personal sacrifices they made for landing a man on the Moon and returning him safely to the Earth. This is the story of some of those unsung heroes of Apollo. Named as TIME magazine’s unsung hero of the Space Program and Apollo 11, Houbolt was responsible for transforming the strategy to get to the Moon from the Werner Von Braun favoured Direct Ascent and landing to the untried and risky Lunar Orbit Rendezvous. A native of Altoona, Iowa, the young John Houbolt always had dreams of flight, at one time jumping from a hay loft with an umbrella and a glider built with wings attached to a baby carriage. But these were hopeful starts, as he soon graduated to winning airplane competitions, became a pilot himself, gained a Masters in Civil Engineering from the University of Illinois and eventually a PhD in Technical Sciences from ETH Zurich in 1957. 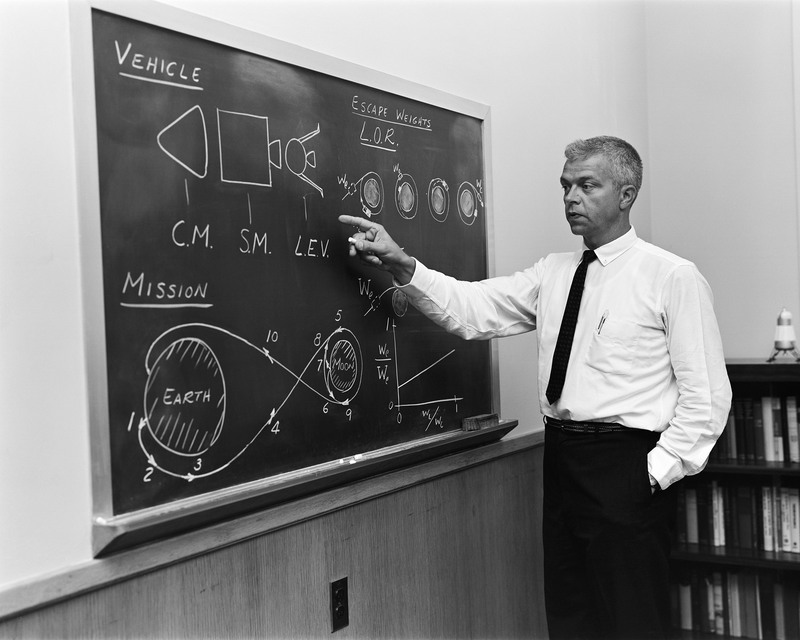 As a self-reliant learner, Houbolt continued his self-tutelage through the ‘50s and ‘60s on space travel principles and Lunar Orbit Rendezvous. However, well before gaining his PhD, Houbolt became a member of the National Advisory Committee for Aeronautics (NACA). NACA later become NASA in 1958, taking Houbolt’s career on an unexpected trajectory. The climate of fear during the Cold War found a productive and technical purpose in the Space Race. Vast teams of engineers and scientists were assembled on both sides of the Iron Curtain to study various methods of getting to the Moon; the Buck Rogers style “Direct Ascent”, Earth-Orbit Rendezvous and Lunar-Orbit Rendezvous (LOR). 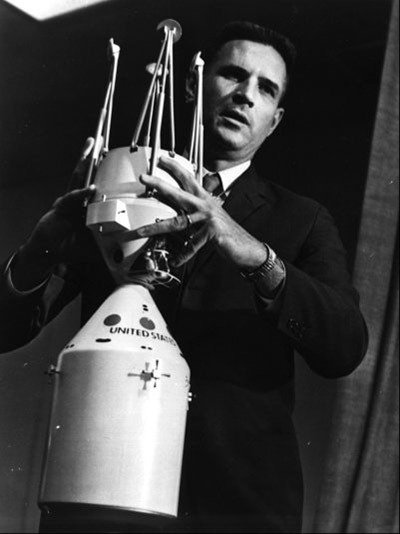 The idea that bigger was better and faster appeared to be winning the minds of NASA program managers and Werner Von Braun himself, until Houbolt deduced that weight would be the deciding factor in winning the race to the Moon. Smaller, modular spacecraft would be essential, more cost effective and faster to develop. LOR required astronauts to leave Earth orbit in a large rocket carrying with them the modular spacecraft needed for a journey to the Moon. Only a small lander was needed to land and launch from the Moon requiring a lunar orbit rendezvous with the mother ship. LOR was first devised by rocket pioneers Yuri Kondratyuk and Hermann Oberth, but had been buried in development hell. Remembering his education and seeing true genius in LOR, Houbolt prepared presentations, lectures and reports proving the value of LOR over other options. Despite his populist methods being ignored for over a year, Houbolt was convinced LOR was the road to the Moon and persevered, at risk to his own reputation. He eventually circumvented the management chain of command by writing directly to NASA Associate Administrator Robert Seamans in a passionate and forceful letter. This letter brought LOR into serious consideration by NASA management and eventually found a supporter in none other than Werner Von Braun, who saw the genius of this idea. Shortly after, LOR was selected as the way to get to the Moon. Houbolt was present at the launch of Apollo 11 and fittingly saw the principle of LOR proved in practice when the Lunar Module “Eagle” touched down and returned to the Command Module “Columbia” in lunar orbit. The recipient of NASA’s medal for Exceptional Scientific Achievement, his story is that of an individual with tenacity and vision who championed an idea at great personal cost because it was right. An individual who did not let obstacles stand in his way. His perceptive vision allowed Apollo to become reality and changed history forever. Scattered on the surface of the Moon are the remains of 6 spidery spacecraft that took 12 men there and back, and remain the only manned spacecraft to have landed on another world. Notably among them is the fifth Lunar “Excursion” Module (LM) to roll off the production line called “Eagle”. And it was an unknown, young, Long Island engineer who “brought up his children” in 7 years that took us there. 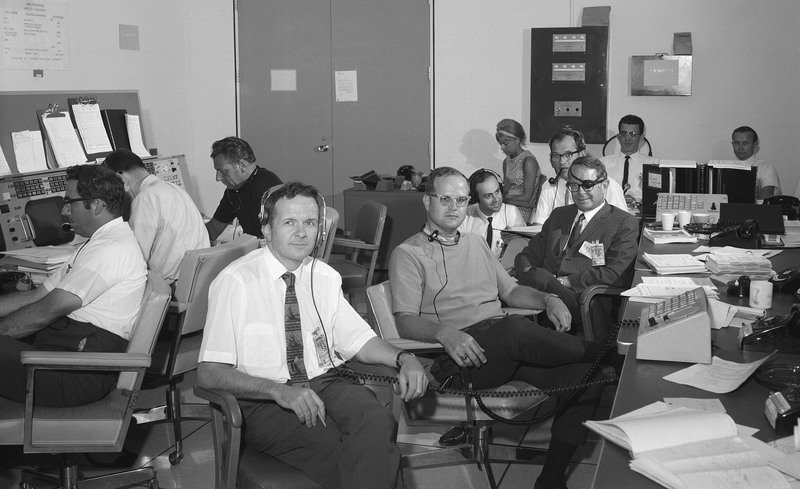 Tom Kelly (front) works in one of the ‘back rooms’ of Mission Control during the Apollo 11 mission. Kelly, a Brooklyn native, earned a Bachelor’s degree in Mechanical Engineering from Cornell University before gaining a Master’s from Columbia University in 1956. Following his time at Cornell he worked as a propulsion engineer at Grumman Aircraft Corporation. After a brief stint as a Lockheed space propulsion engineer he returned to Grumman to independently study and form methods to get people to the Moon with a study group of like-minded engineers before Kennedy issued the challenge with his famous “We Choose to Go to The Moon” speech. Amongst the methods researched was Lunar Orbit Rendezvous (LOR). Gaining valuable experience sub-contracting under General Electric for Apollo, Kelly also assisted in the rationalisation of the LOR concept. When NASA selected LOR as the road to the Moon, Kelly and his team were miles ahead of the competition. In 1962 Grumman were contracted by NASA to build the LM. Kelly led the engineering team to design and develop a machine in 7 years to land on the Moon in conditions unlike anything experienced on Earth. Under his leadership the 3000 engineers and 4000 technicians at Grumman conceived, designed the critical manufacturing techniques, constructed, integrated materials, parts, systems and tested the LM. Transforming designs into functioning hardware, his growing team quickly and frequently ran into unforeseen problems and repeatedly made radical refinements to the design of this two-stage fully throttle-able spacecraft. Kelly faced incredible pressure from both NASA and the administration who were disappointed with the lack of progress against Kennedy’s end of the decade deadline. Steering an ever evolving company to simultaneously create the LM, construction methods, acceptance tests and procedures, Kelly and his team were already behind from day one. However, his mantra of never giving up on a problem and seeking engineering excellence echoed well with the NASA mind-set of the time and eventually won the day. Kelly recognised that “we were all part of a majestic endeavour and that we were making history happen”. Given how deeply involved Kelly was with each LM’s development and maturation, he very much saw the LMs as his “children” and was personally invested in their delivery. To gain pace in the testing phase and completion of the LM, Kelly fostered a culture of transparent inclusivity, bringing the Apollo astronauts and technicians in to help provide input and advice on the test performances of the new spacecraft. This partnership finessed each hand made LM, on target for each mission. LM-3 dubbed “Spider” was successfully manned and flight tested In Earth orbit by the Apollo 9 crew, Jim McDivitt and Rusty Schweickart, later docking with David Scott piloting the Command Module “Gumdrop”. Apollo 10 expanded the LM’s operational envelope as Tom Stafford and Gene Cernan painted a white line for later missions, piloting LM-4 “Snoopy” down to 8.4 nautical miles above the Moon, before separating from the descent stage and returning to the Command Module “Charlie Brown”. As LM-5 “Eagle” settled into the lunar dust on July 20th 1969, Tom Kelly’s dedicated hard work and that of the thousands working under him, finally paid off. His pride in saving the lives of the Apollo 13 crew using the LM as a lifeboat is also well deserved. Without his leader-ship this unique spacecraft would not have been completed on time, let alone flown successfully before Kennedy’s pledge to land a man on the Moon and return him safely to the Earth expired in 1970. Tom Kelly himself recognised that the crucible of Apollo focused goal orientated teamwork, raised abilities, ambitions and aspirations of a nation to exceed its wildest dreams. In doing so, the rich technological returns have also revealed the finest possibilities of human achievement. The legacy of this man’s accomplishments cannot be understated. Who was Ellie Foraker? Her name is certainly not up there in lights with Neil Armstrong, Buzz Aldrin, Gene Kranz, John F. Kennedy or their ilk. How did she come to be connected with the Apollo Program and its high flying astronauts? Before Kennedy’s pledge to have a man actually walk on the Moon high altitude pressure suits had been designed purely for emergencies. The cockpits of high altitude aircraft or early spacecraft were the first line of defence to the vacuum of space. Apollo required something more robust altogether, but NASA had no knowledge of how to build a flexible yet protective space (and Moon) suit which was literally another mini spacecraft around an astronaut. In 1962 NASA invited tenders from contractors to build the new Apollo Spacesuit, a huge leap forward from the Mercury and Gemini programs suits. Many were well known names in the aviation and engineering industries with vast experience, but none had solved the problem of how to build a flexible and portable spacesuit for walking on the Moon. An outsider, the International Latex Corporation (ILC), known for Playtex undergarments won the contract to build the Apollo spacesuit. ILC had one huge advantage; they knew how to make personalised, form fitting, flexible rubber garments that were perfect for the Apollo spacesuits’ needs. However ILC had no experience with huge government contracts and so Hamilton Standard, an engineering company with this requisite experience was given oversight on the project. 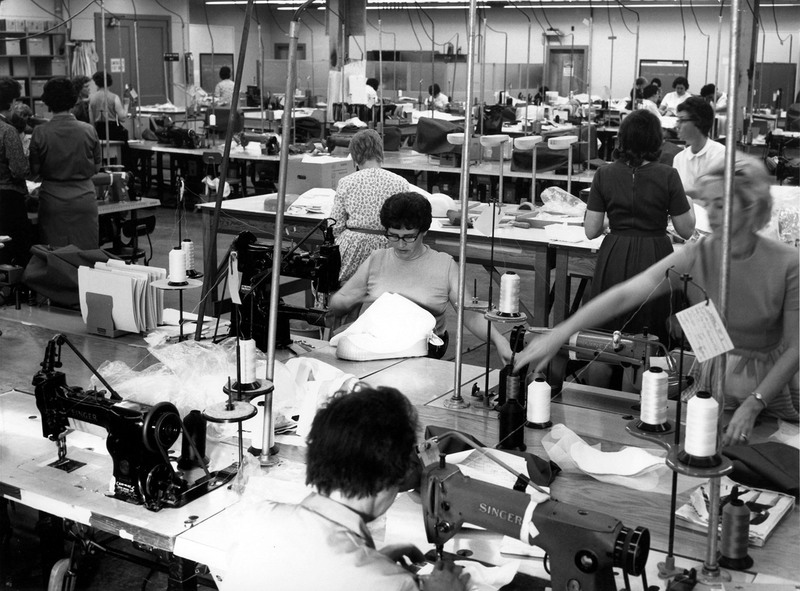 At the time Ellie Foraker was a seamstress manager working on the floor making baby clothing at ILC. Along with many talented seamstress employees she was transferred to the ILC arm now contracted to produce the Apollo spacesuits. This work was long and arduous with a high degree of unprecedented engineering standard precision required to produce each personalised suit. Usual sewing tools were discouraged for safety reasons. For example, seamstresses had to sew together the spacesuit’s outer Thermal Micrometeoroid Garment’s 17 layers with seams over hundreds of yards using their fingers. Quality and tolerance control was a priority; each stitch was counted and measured to within a pinhead. Anything less than perfection was unacceptable. Occasionally sewing pins were needed. However the constant danger of losing sewing pins within a spacesuit could lead to a fatality on the Moon, so Foraker was tasked with pin management and tracking all pins to each seamstress in her team. The life of each astronaut wearing these suits was very much in the hands of Foraker and her team. One wrong stitch, one lost pin, could mean disaster later down the road. Simultaneously, Hamilton Standard produced the life support backpack and the internal cooling system for the new spacesuit. By 1964 fully completed spacesuits were being delivered to NASA but they fell well short of NASA’s acceptance criteria. Longstanding differences between ILC and Hamilton Standard erupted and NASA, with no confidence in receiving a suitable spacesuit on time, terminated the contract. Re-launching the Apollo spacesuit competition in 1965, both Hamilton Standard and ILC submitted their own independent designs for spacesuits. 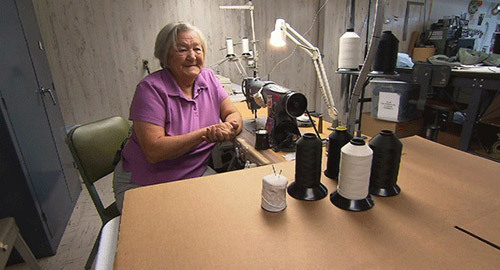 With the clock ticking, seamstresses like Foraker worked harder than ever to improve their designs and produce a final suit for NASA. Powered by dreams of success ILC staff pushed on and free of Hamilton Standard’s constrictions re-designed a newer form fitting spacesuit that was far more flexible and beat out the competition. As a result, NASA used the best ideas from both contractors. The final A7L spacesuit contained ILC’s inner cooling garment, and on top of that a flexible air pressure suit. The final protective layer was a tough external nylon / non-flammable beta-cloth layer. Hamilton Standard provided the life support backpack. As the spacesuit was put through its paces on the Apollo missions, the ultimate test came on July 21, 1969. The world rejoiced as Neil Armstrong took humanity’s first steps on the Moon, but for Foraker and her ILC co-workers this momentous day was filled with fear. Armstrong’s and Aldrin’s slips and low gravity bounces caused high stress and concern over accidental damage to the spacesuit, but of course there were none. This is a testament to the huge dedication and talent of Foraker and those who worked with her in producing a high quality, flexible and tough spacesuit. Over the coming months and years, men would return to the Moon in these remarkable spacesuits to explore, experiment, work and even play golf on an alien and hostile world. And each one returned home, thanks to the likes of Ellie Foraker. In an era of macho pilots, politically bruising management and buttoned down engineers, Joe Shea brought a no nonsense Bronx attitude with a calm but assertive and unifying authority to the Apollo Program overseeing the development of the Apollo spacecraft. A maths whiz, he received an engineering education at the University of Michigan before gaining an engineering doctorate via Dartmouth and MIT. His technical aptitude and managerial savvy were becoming well known and sought after by firms such as Bell Labs and General Motors. After delivering the Titan 2 ICBM missile guidance system on time within budget for Bell Labs, NASA invited him to help them answer Kennedy’s clarion call to land a man on the Moon. Shea believed in Kennedy’s mission and stepped up for the cause despite a huge pay cut, joining the Office of Manned Spaceflight in 1961 to share his systems engineering expertise. 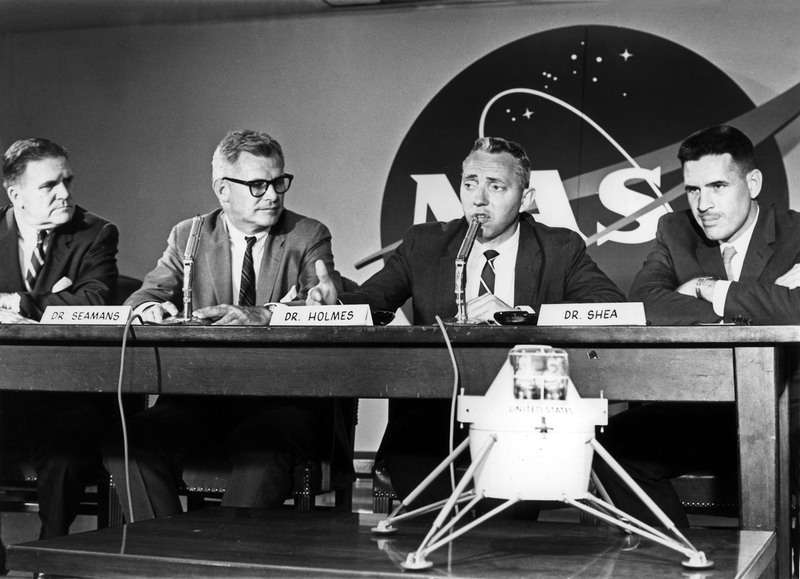 With his ability to win a strong consensus between various, culturally different and independent NASA centres, Shea greatly assisted in smoothing the waters for acceptance of the LOR concept throughout NASA. In 1963 he became the new head of the Apollo Spacecraft Program Office (ASPO), with the same consensus building mandate between NASA and its contractor North American Aviation. At the time warring factions within NASA and North American had been unable to reach agreements on how to build the Apollo Command Module (CM), burning out two of Shea’s predecessors and seriously impacting the ability to build a Moon ship before the end of the 1960’s. Even though Shea also met resistance, he reached an accommodation with North American Aviation manager Harrison Storms to stem the flood of change requests, disagreements and find a way forward. With a sense of engineering discipline and renewed cooperative purpose, the CM was finally being built and tested. Naturally being in the spotlight Shea was a target for hostile criticism but even his enemies acknowledged his considerable engineering nous and managerial style that had finally given forward momentum to the ASPO. TIME Magazine was even planning to have Shea grace their cover in February 1967. And then tragedy struck. On January 27, 1967, the complicated and by now widely known to be problematic Apollo 1 CM underwent a routine “plugs out” test with the crew of Gus Grissom, Ed White and Roger Chaffee on board. A spark from frayed wiring inside the CM ignited flammable Velcro in the high pressure pure oxygen environment starting a flash fire, killing all three astronauts in seconds. As recriminations and reviews began in the aftermath, Shea became part of the advisory group on the investigation. Feeling a sense of personal responsibility to the program and especially to the lost crew who were his friends, he began working eighty hour weeks. Shea and Storms, the pair most responsible for the advances made to date were side lined so that the program could continue. Shea in particular suffered a heavy and personal toll. Following the loss of the crew and overwork he suffered a breakdown. Eventually following his recovery but still in a fragile state, Shea was moved to NASA HQ in Washington but left shortly after for a renewed career first at Polaroid, then at Raytheon and eventually as a professor at MIT. His story shows the intense personal responsibility and costs carried by some of those working within the program. Were it not for Joe Shea’s skill as an engineering leader and a fair diplomat within and without NASA, the program could easily have ground to a halt. In the glare of astronaut publicity, contributions such as Shea’s must not be forgotten or else we would never have been able to make the voyage from the Earth to the Moon. How do you get a group of test pilot/engineers interested in a bunch of rocks? How can you teach these hard-nosed astronauts to be geologist detectives around rocks and soil, especially on the surface of the Moon? For some time the Apollo astronauts (and would-be geology students) had been bombarded with jargon filled classroom geology lectures that did not excite them. This had been a nagging problem for NASA as they prepared for the Moon landings. After all, one cannot spend billions of dollars going to our nearest planetary neighbour just for pretty pictures. Neil Armstrong himself broke the mission parameters, exploring beyond the Apollo 11 landing camera’s field of view to collect 80 kilograms of interesting lunar rock samples. He began the “meat part” of the Apollo missions, but not seeing where he had collected the rocks from, there was no detailed context to their story. Enter Caltech Professor of Geology Lee Silver. As an Apollo lunar sample investigator, Silver had been invited by his old student Harrison “Jack” Schmitt to meet with James Lovell and Fred Haise (assigned to Apollo 13) to discuss teaching the astronauts some basic field geology. Given the chance to spend a week proving his teaching methods and the absolute need for good planetary science on Apollo, Silver took a party of astronauts on a camping field trip into the Californian Orocopia Mountains. 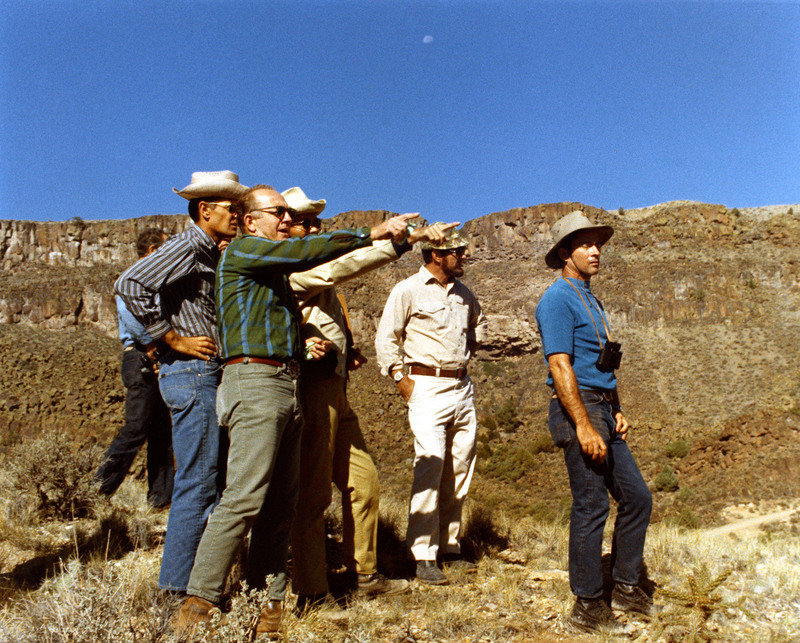 With the beautiful Orocopias at their feet, Silver’s students including James Lovell, Fred Haise, John Young, Charlie Duke and Jack Schmitt, entered a new and beautiful world of geological discovery. Silver began organising further cross country field trips with a hungry enthusiasm, investigative acumen and sharpness akin to a test pilot’s that spoke the same language and spread among his Apollo apprentices. Soon after, further astronauts joined the field trips including David Scott and James Irwin whose geological findings from Apollo 15 are attributable to Professor Silver’s teachings. Using the Earth’s natural environment as a stand in for the Moon’s was a masterstroke. The new geology students practiced dress rehearsals of their missions, standing by Lunar Module substitutes (trees) and describing the 360 degree landscape views as a geologist would. Interpreting each other’s detailed descriptions each of the astronauts became quick students in geological observation. Under Silver’s tutelage, their innate curiosity ran wild, collecting a variety (or a “suite”) of rock samples each one telling a line in the story about the evolution of the Orocopia Mountains. Silver imposed time and sample limits on collecting these rock suites, just as the astronauts would face on the Moon and their rock collections became more refined, much to the later benefit of the actual missions. 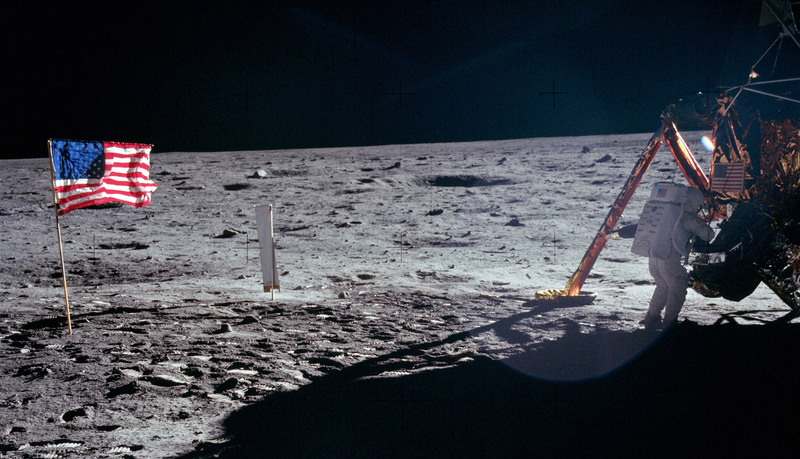 Observing and sampling within the exposed strata of geological time on the Earth, the Apollo astronauts, now armed with the tools of scientific observation, were prepared to tell the story of the Moon. When the true scientific “J” missions began on Apollo, Silver himself was in the back-room of Mission Control steering the geology ground teams and acting as a back seat driver for the lunar roving astro-geologists on the Moon. Dave Scott and Jim Irwin had been trained to find anorthosite during their Apollo 15 mission, a piece of the primordial lunar crust that would prove the Moon’s age. On August 1, 1971 on Hadley Delta, Scott radioed back to the ground that he and Irwin had found just that. The “Genesis” rock would later prove to be 4.5 billion years old giving rise to the widely accepted theory that a Mars sized body had collided with the Earth spinning off matter that later formed the Moon. Silver himself described this find as “hitting a home run” which validated his supreme teaching efforts to embed science within the Apollo missions. Were it not for Lee Silver, the Moon’s story and relationship with the Earth would still be relatively unknown. His unique and exciting teaching methods imbued a sense of urgent exploration, not just of the Moon but of science, always looking to push the boundaries of knowledge and follow the observational evidence wherever it leads. The men returning home from the Moon at an incredible 25,000 miles per hour faced a blistering re-entry into the Earth’s atmosphere encountering soaring temperatures of 5,000 degrees Fahrenheit. Death was but feet away were it not for an ablative heat shield installed on the base of the Command Module (CM) that melted and eroded away as the heat of atmospheric friction built up. Many engineers were involved in designing the heat shield and other systems that would bring each crew home safely. Dorothy Lee was one such engineer specialising in ablative heat shield technology. Dottie Lee’s childhood interest in astrophysics led her to believe early on that humanity was destined to reach the Moon. As an alumnus of Randolph-Macon Women’s College in Virginia, Lee proved she was a natural at mathematics and upon graduation was soon recruited in 1948 to work for NACA (National Advisory Committee for Aeronautics). Placed in their PARD (Pilotless Aircraft Research Division) under the direction of Langley Research Centre, she was a “human computer with a calculator” testing different configurations of launch vehicles from Wallops Island. She explored the characteristics of blunt nosed and cone shaped vehicles, trajectory and spacecraft stability all of which informed her later work. Lee was soon invited to work for the director of engineering and development Dr Max Faget, the famous designer of the Mercury capsule and who later contributed to the designs of the Gemini, Apollo and Space Shuttle spacecraft. As the only lady working with a team of male engineers under Faget, the “human computer with a calculator” was adopted into this exclusive engineering club and soon excelled as an astute project engineer responsible for her own teams. Then, on October 4th 1957, Sputnik orbited the world and everything changed. NACA was re-tasked from an advisory body into NASA and funding soon began to flow into new projects. Lee moved to Houston and the principles developed on Mercury were translated onto the Apollo Program. The earlier work Lee had done at the PARD on trajectories, spacecraft stability and blunt/cone shaped spacecraft properties became essential in predicting the performance of the ablative Apollo heat shield, or Thermal Protection System (TPS) as it was known. 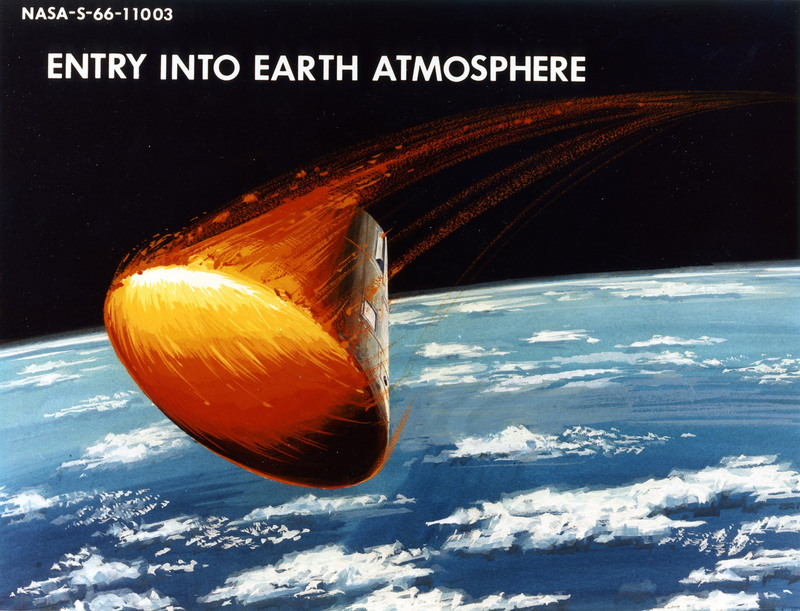 Given the predicted orbital and super-orbital velocities Apollo spacecraft would encounter, she and her team made a series of calculations to measure the aero-thermodynamic characteristics of an Apollo Command Module (CM) at re-entry. Wind tunnel tests gathered pressure and heating rate data at varying angles of attack with the atmosphere. 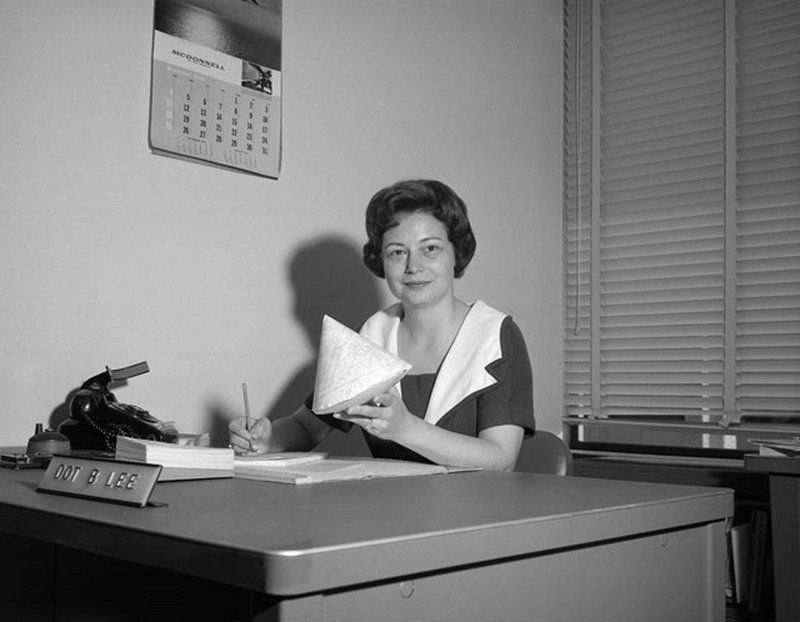 Along with previous data gathered from the orbital flights of the Mercury and Gemini programs, Lee was then able to collate the data, punch their values into a series of cards, and feed the cards into a floor filling computer for analysis. This was a difficult and slow process as computers at the time were in their infancy. They were huge, slow and had only a fraction of the power and portability of an average phone today. Despite this, Lee was able to calculate predictions of the extreme temperatures and pressure generated from a super-orbital speed re-entry. However these were all still theoretical. Based on Lee’s predictions, incremental work began to refine the ablative heat shield technology previously used on Mercury and Gemini spacecraft. This required significant upgrading of the tools, materials and techniques as the Apollo Command Module (CM) heat shield was much bigger than its predecessors and would encounter far greater stresses. Materials such as Teflon were explored, but finally, a new Avcoat epoxy resin was used. This epoxy novalic resin was created with additives in a special fibreglass honeycomb matrix injected into a brazed steel structure. This matrix was bonded to the shell of the CM, where each honeycomb was painstakingly filled by the mixture, cured and inspected. Any defects meant the resin had to be removed and the whole process restarted from scratch. It had to be perfect as any anomalies in the resin could cost the lives of an Apollo crew. Following Lee’s theoretical predictions and the production of a satisfactory heat shield, four unmanned heat shield qualification flight tests were done at orbital (up to approximately 18,000 mph) and super-orbital (up to approximately 24,000 mph) re-entry speeds with Block-1 Apollo CMs. Each CM included pressure transducers, radiometers and surface mounted calorimeters to capture data during re-entry. The flight data was compared with Lee’s theoretical predictions to confirm her calculations and the design of the heat shield was correct. The results proved that the use of Lee’s pre-flight theoretical predictions and the use of wind tunnel test data were essential in the design of the Apollo spacecraft, and especially so for its extreme re-entry conditions. The legacy of Dottie Lee’s work are clear; four unmanned Apollo and subsequent manned Apollo flights protected the spacecraft and carried its crews across the fiery last obstacle of re-entry before returning home. Such is the trust in her work that NASA continued to promote Lee and retain her experience where she directed large project teams in the design of the thermal protection system for the Space Shuttle. Her vast experience with cone shaped spacecraft was incorporated into the design of the Shuttle’s nose cone which was nicknamed “Dottie’s Nose”. Now the legacy of her early work back on Wallops Island and since has been continued once again. On June 5th 2014 engineers at NASA’s Johnson Space Center in Houston installed the largest heat shield ever made to the new Orion spacecraft. The heat shield is made from Avcoat (the same material used on Apollo CMs) and is built on the same theoretical predictions made by Lee so many decades before. In an echo of the 1960’s Apollo heat shield tests, in December 2014, Orion will undergo its own super-orbital velocity tests with a 20,000 mph re-entry from space. Crews past, present and future have a debt of gratitude to this “human computer with a calculator”. Here is a rare perspective on a story we only thought we knew. For Apollo 11, the first Moon landing, is a story that belongs to many, not just the few and famous. It belongs to the seamstress who put together twenty-two layers of fabric for each space suit. To the engineers who created a special heat shield to protect the capsule during its fiery reentry. It belongs to the flight directors, camera designers, software experts, suit testers, telescope crew, aerospace technicians, photo developers, engineers, and navigators. Gathering direct quotes from some of these folks who worked behind the scenes, Catherine Thimmesh reveals their very human worries and concerns. Culling NASA transcripts, national archives, and stunning NASA photos from Apollo 11, she captures not only the sheer magnitude of this feat but also the dedication, ingenuity, and perseverance of the greatest team ever – the team that worked to first put man on that great gray rock in the sky. This recommended book may be purchased at www.amazon.com.